Complete systems mounted to a polypropylene board. These systems are designed to control pools up to 100,000 gallons. Larger pools may require larger GPD peristaltic pumps. 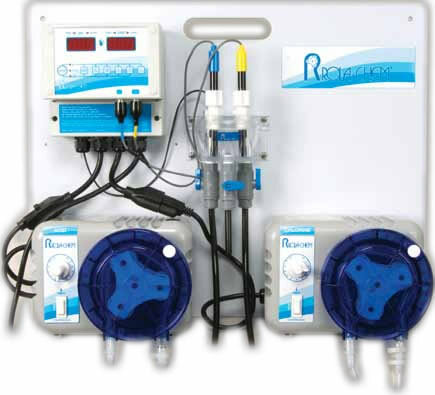 Rola-Chem wall systems include a controller, flow cell with flow switch, probes, tubing, fittings, and two 32 GPD peristaltic pumps. The controller contains innovative and user-friendly features, with single button calibration, pH monitoring, dosing options, and more. The control panels are easy to read with a sun-bright LED display and are flow switch compatible, excellent for any pool owner. Recommended for use with salt chlorine generators.